January 2, 1823– A meeting was held at the home of Mr. Oliver Lee. A subscription Library was established and a Board of twelve Trustees was elected. More than $100 was raised. No location is mentioned, but later a Mechanics Reading Room located on the west side of Main Street was started in 1841. It was mentioned in Beer’s County History (1880). December 15, 1869– At the meeting of Trustees for the Union Free School, a Library Committee was appointed: Professor Charles Henry Dan (School Principal), Linus W. Thayer Esq., Rev. John V. Stryker, William H. Merril (Western New Yorker Publisher), and John Ransom (Wyoming Democrat Publisher). January 6, 1870– The Library Committee selected $500.00 worth of books to be kept at the Academy (Union Free School). Half of the funds were from new subscriptions, and half were from the State Literature Fund. Approximately 400 books were purchased, and 500 more were donated. February 24, 1870– The rooms in the school set aside for the Library were almost ready. March 10, 1870– Drawing of books by the public began. It cost $2.50 to subscribe to the Library, or a patron could pay $.10 a week. One book could be checked out at a time. Books were lent for two weeks and overdue fines were $.10 a week. The Library was open to the public once a week on Wednesday afternoons. June 9, 1870– The first Library Catalogue was printed. 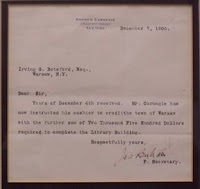 1903– The Warsaw Board of Education contacted Andrew Carnegie requesting funds for a new Library Building. Interest in a separate building was expressed as far back as 1898. The land where the Library is now located was donated by the Honorable Augustus Frank. December 12, 1903– The Town Board became involved. Mr. Carnegie’s personal secretary was contacted. He reported that if the town voted to raise $1,000 a year for Library upkeep, Mr. Carnegie would donate $10,000 for the building. January 26, 1904– The special town vote was nearly unanimous in favor of the new Library, 390 for and 16 against according to the Western New Yorker, and 173 for and 16 against according to the Warsaw Town Board Minutes. The Board of Education would donate the Library Corporation to the Township. The circulating Library consisted of 5,381 volumes valued at $5,000. March 10, 1904– The Warsaw Town Board appointed a Library Board consisting of: Mrs. Agnes M. Frank, John B. Smallwood, N.S. Beardslee, W.H. Cheney, I.B. Smith, and S.B. Whitlock. April 29, 1905– Mrs. Augustus Frank formally deeded the property at Main and Court Streets to the Town of Warsaw. May 1904– The Library Board received its Charter from the New York State Board of Regents and the authority to build a Library. May 14, 1905– The architect Albert Randolph Ross (1869-1948) toured the site. June 16, 1905– The first sod was turned for construction. May 1906– The Library opened with no formal ceremony. June 3, 1991– The Dedication of the Warsaw Public Library Expansion and Renovation took place. The total cost of the project was $423,404.26, paid for using funds from a Federal Library Services and Construction Act Title III grant, a citizen fundraiser and bonds issued by the town of Warsaw. Dann, Mary E. History of Warsaw Public Library Founded in 1870 by Charles Henry Dann. East Aurora: Roycrofters, 1917. Bishop, Lewis, H. The Libraries of Warsaw, a paper. Lane, David, M., Questions and Answers about the Beginnings of the Warsaw Public Library Building, a paper, 1989(?). Any resident of the town of Warsaw shall be entitled to the free use of the Library. Any person living outside the township shall be entitled to the use of the Library upon the annual payment of one dollar ($1.00). Non-resident pupils attending the public school shall be permitted the free use of the Library during the school year. The reading rooms are free to all for the purpose of consulting books and periodicals. We have many Genealogy manuals to check out. They are also found on our local History/Genealogy shelf. You can also browse our History Room collection using the online catalog. Biographical Review- Livingston and Wyoming Co. Located across the street from Warsaw Public Library. Gates House, 15 Perry Ave.